I have fine, wavy/curly hair which definitely presents some challenges (aka FRIZZ) in the summertime humidity. Although I am admittedly still searching for the Goldilocks of Shampoos and Conditioners, this styling product has proved to be “it” for me. I consider it a Goldilocks product because it doesn’t weigh my hair down too much, doesn’t make it too crunchy or stiff but yet still provides some hold and definition. I apply this on damp hair right after my shower or even as a next day refresh. Works. Every. Single. Time. Link to product below and image from http://www.sephora.com. Disclosure: Unfortunately we do not receive any reimbursement of any kind for these reviews. 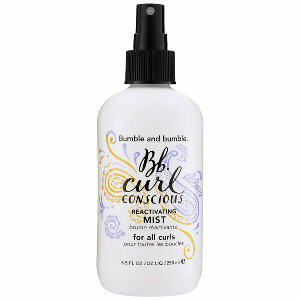 This entry was posted in Beauty, Hair and tagged best styling product for curly hair, Bumble and Bumble, Bumble and Bumble Curl Conscious, bumble and bumble review, curly hair styling products by surgeoninkicks. Bookmark the permalink. I have a hard time finding products for my hair too–I have fine, curly hair and finding the right product that a) doesn’t weight it down and b)lets it curl fantastically and c)doesn’t make it sticky, stiff or matted the next day (I only wash my hair twice a week or so) is a challenge. I’m going to try this product out-Always looking for something great! As far as shampoo/conditioners go, have you tried Wen? You have to buy it online, and I usually use much less than they recommend, so I only get it shipped twice a year or so. I find it works great! It doesn’t have the sodium laurel sulfate in it everyone is trying to avoid, so it doesn’t suds up like a shampoo, but it conditions really well. If I need to wash my hair a few days in a row, then it doesn’t dry out my scalp or hair. They call it a ‘shampooing conditioner’…I like that I only have to put one thing in my hair to wash/moisturize it…I’m a physician too (but not a trauma momma like you) but I also hate mornings and the less I have to do to get ready so I can sleep in longer, the better! It usually comes with some samples of their hair gels/cremes/etc, which I also like. I just find for my length of hair I have to use more of the creme than I’d like for the size and cost of the bottle…but if I mix some of the creme with a little of the smoothing gloss, I can use less of the creme (just a little hint I picked up).